What the heck is a Stang anyway? In our tradition the Stang represents the Horned God Cernunnos in his aspects of protector, destroyer and life giver. Robert Cochrane is commonly thought to be responsible for the introduction of the Stang into Wicca. Cochrane founded the Clan of Tubal Cain 1951 – 1966 a British Mystery Tradition. He called himself a “cunning man” or witch, and was an important figure in neo pagan witchcraft. Cochrane founded a religion called Cochrane’s Craft which some believe is a form of Wicca. Others believe that Cochrane’s Craft is a distinct and separate faith because he was openly opposed to Gerald Gardner and Gardnerian Wicca. The word “Stang” is derived from the Anglo Saxon term staeng or steng which translates as pole or rod. A traditional Wiccan Stang is a staff, shoulder height in length, with a fork at the top resembling the horns or antlers of the male animal. The Stang is used as a greater magickal weapon of fire and represents the Horned God and the male aspect of nature. 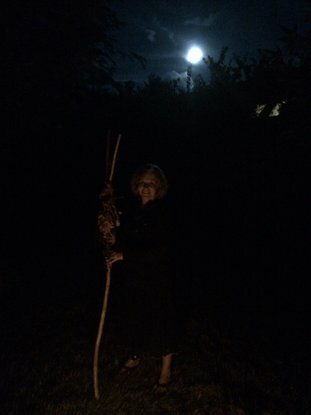 In other traditions such as Raven Grimassi’s Strega the Stang is used as a tool portraying the Goddess. The Stang is also symbolic of the World Tree with branches in the Upper World and roots in the Underworld with the trunk running through our Middle Earth. The Stang represents the channel between Sky and Earth. It is a physical representation of the Goddess, the God and their Children. One fork is the Goddess; one fork is the God and the shaft, their Children. The Stang can serve as an altar without anything else commonly used on altars. Symbolically the Stang can replace the Chalice (forked yoni) and the Athame (the shaft). The Stang is physically a Staff, which means it functions as a Wand and its base is often thrust into the ground, which completes the list of Elemental Tools, the Pentacle. The fork (yoni) represents the Goddess, while the God is represented by the shaft (lingam). So, the Stang also represents Their Union, the Great Rite within Wicca. Standing in or behind a cauldron, it reminds us of the greatest of all mysteries, the cycle of life, death and rebirth.